Ok, you’re getting a break from me today courtesy of a debut piece on here from a new addition. James is Chelsea through and through and he’s not bad at this writing lark, so here’s his take on our midfield right now…. When I think back to the Chelsea side that Jose Mourinho assembled in his first season as manager, I have a great feeling of longing for what once was. Perverse, you might say, given what we have achieved without him. Granted, under Ancelotti we won trophies playing merciless attacking football, which was not only entertaining, but left opposition teams feeling violated, which was absolutely fantastic. And last season, our very own nine-lived cat lifted the European Cup, and banished the demons that have lingered since Moscow. After AVB, the ‘master’ of subtle man-management had left the club, we showed resilience and courage beyond what many had thought possible of the team. Following last season’s ugly, hard-fought European victory, Roman Abramovich wants an array of dazzling attacking players to light up Stamford Bridge and make Chelsea F.C. a world-famous brand known for artistic football. We all know this. It is no secret he wants beauty as well as results. You could argue in that respect that for the time being we are assured, in the form of Juan Mata and Eden Hazard, young, versatile, quick-thinking players who can produce a goal-scoring opportunity from nothing. In these players, we have the tools to get between opposition lines of defence and midfield, and exploit the opposition in a way that is ever-present in modern football. What is concerning is that since the departure of Claude Makelele in 2008, we have lacked a world class defensive midfielder. True, we have had excellent players occupy that position, including Michael Essien, Michael Ballack, and more recently Frank Lampard. However none of these players are/were naturally defensive. Snuffing out opposition attacks is not their primary objective. And this is the genesis of my longing for Mourinho. He recognised this, and consequently Makelele was one of the mainstays of Mourinho’s reign. Filling this anchoring role is something Roberto Di Matteo needs to address, because, let’s face it, within a couple of years Lamps will need a Zimmer frame to get past the halfway line, and John Obi Mikel will need said Lamps to hold his hand at any given opportunity, which means one thing; a weak defensive shield. However, there is a solution to this problem, and is sat under our very noses. Why the Spaniard has not been played more until now is a tad surprising. In the brief spell during Villas-Boas’ reign, whenever he was selected, he looked a clever, resourceful player. He has an excellent passing range, moves the ball quickly from deep positions and has a sharp intelligence for reading the opposition’s attack, which more often than not has resulted in him breaking up play in front of the back four. He shone in the big games at that time. In our must-win game against Valencia in the Champions League group stage, he was outstanding, operating in a deep defensive position, always ready to start an attack once he had won the ball. In our 2-1 league win against Manchester City, he had David Silva, one of the most creative players in world football, and the in-form Premier League player at the time, in his back pocket. Yet Di Matteo does not seem to favour him, and even towards the end of his tenure AVB used him less frequently. But consider that he is a graduate of Barcelona’s famous La Masia academy, and that he has only recently turned 21, and we have a player of real pedigree on our hands. In my eyes, the only obstacle to him being a fixture in the side is the £13m buy-back clause that Barcelona could activate next summer. Arguably, if he were to get another run in the team at Chelsea he would inevitably catch the eye of Barca manager Tito Vilanova, and we would lose a real talent to a European rival. Perhaps the thinking is that if we keep him under the radar, they may lose interest. That’s what I hope anyway. Compare what Romeu can offer in contrast to John Obi Mikel. Mikel is a capable player, although we might forget it at times. He can pass well, is strong and is technically good. However his game, as a defensive midfielder, is thoroughly flawed by an occasional inept sense of positioning, and a casual trot around the park which shows a certain indifference to his role. You don’t get that from Romeu. He knows exactly where he needs to be on the pitch and acts quickly, both in challenging the opposition and moving the ball up the field to provide a platform for the likes of Mata and Hazard to hit the opposition when they are frail. Many will cry that Mikel is worthy of a place following his European displays last season. This would be a valid point were it not for the fact that we will not be playing Barcelona and Bayern Munich every week. He will not raise his game to what it could be, and instead will settle for mediocrity, in games where we need consistent performers, not insignificant bystanders. He is a glass half-full, holding many skills that are of real use, but flawed by his own errors. Mikel is not without his use, but if Di Matteo has a brief of building a team of real class, then he needs to start with the basics, and ensure the supply line to our artistic attackers is not blocked by pedestrian passing. In Romeu he has the chance to blood a true talent, a player who has had the education, and now the opportunity to become a player of real quality. Please Bobby, if we don’t make the most of Romeu then someone else will. We all ar on the same ship, so there is know need for arguement. Romue should be given a chance to prove his worth, we don’t hav to depend on mikel alone. What of if mikel gets injury, think of what will happen since romue is not often played. RMD should help chelsea and build both first and second XI. Thanks, up chelsea! Are we at the moment good enough to beat Real Madrid ? They have Alonso – who I think was the best player in the Euro’s, not Iniesta. David Luiz could be our Alonso. I would play him in front of the defence alongside either Mikel or Romeu. He is both creative and defenesive. The problem we have at the moment is that we give the ball away easily at the back. We have very creative players up front, so we need a rock at the back. Luiz is too erratic in defence. The Gervinho goal was his fault, and we could have given away 3 points. I think RDM should experiment with Norwich’s visit and play him in front of Ivan and Cahill – two very strong/Terry like defenders. I personally would like to see romeu given more of a chance, as when he has played, he holds the ball well, and does not give it away. Watch Alonso for spain, mopping up attacks and giving the ball via a simple pass to Ineista & co.
who’s got both quality of defense and attack embedded in him. 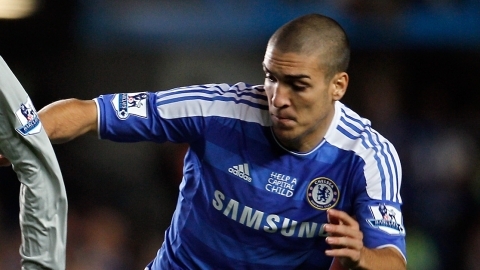 Thus, Romeu is YOUNG and can learn and would prove to be big asset for future IF GIVEN sufficient time to develop. Mikel is good for Chelsea, he might not be the best I̶̲̥̅̊n̶̲̥̅̊ the world, but he’S̶̲̥̅​​ ą great talent. If Romeu is who you really take him as is RDM and Barca blind? Didn’t Messi, Pedro n Alcantara make it through the youth team? Mikel will also improve. J̶̲̥̅̊υ̲̣̥Ƨ̷̜̩̌̋τ̲̣̣̥ say U̶̲̥̅̊ want Romeu to play, dats all! Time will come for him, mikel waited for this time. And for U̶̲̥̅̊r̶̲̥̅̊ info, if U̶̲̥̅̊’ve got nothing to write about, Compare Torres n Lukakau!! They have a right of first refusal should Chelsea decide to sell. Can we please get this right? Romeu looked very promising before his injury last season. I’m very disappointed that Di Matteo hasn’t played him. Romeu is so so good that barca sold him last summer & bought song! Why dint they keep him at all cost like Thiago e.t.c? I want him to have more game time, but he’s Mikel’s understudy! Much has been said in the numerous comments, what I want to take you on is for considering Lamps as 1 of the “Excellent” players that have played in the DM position! I guess you must have been watching the “back” of you TV! Lampard has actually been Mikel’s problem this season cos he leaves him “open” at the back (going & staying forward always) instead of working with him as d def. duo. This is confirmed when Meireles & Ramires who are more disciplined played with Mikel. But you still saw “excellent” Lamps & “not good enough” Mikel, which confirms tha fact that you’re BLINDED with BIAS!!! I think Luiz and ramires would be a brilliant partnership in the DM role. There both great defesivly. Fast, creative and Chelsea would benifit from this aswell because I’m sure it easier playing with the guy next to you who speaks your first language. Mikel is a great player he just lacks that creative flair that Chelsea would also benifit from. hey dude I think you are true that Mikel is good but what the need of time for chelsea is different than what he provides………Chelsea have changed there game and we wanna play more attacking game .So, to fully utilize our attacking talent we need someone better in that position …….then who so ever it may be doesn’t really matter but what matters is we need someone really quick and has balance of both defensive and attacking talent . When i compare Mikel with Essien (3 year ago) , I don’t see Mikel as good . I don’t remember Mikel taking shot from outside the box and hitting the target while ESSIEN has stunned many goalkeepers. I’m so so disappointed at your rating. Mikel is a lot better than Romeu. Mikel is like the rock. Maybe not as good as Makalele, but he is a lot more significant to the team than lamps, romeu or ramires(defensively though 4 ramires). Oga.. park well jor. u cant agree more @ fr francis. World Soccer says, contrary to popular belief, there’s no buyback clause in Romeu’s contract, so Barca don’t have the option to take him back. Mikel is the right man for our team! Romue will get his chances soon enough.